Hellfire II missiles are accurate and powerful, but expensive. Hydra 70 rockets are relatively cheap but unguided and far less accurate, which increases the chances of incurring collateral damage. But by combining a Hellfire's guidance and launcher with a Hydra's warhead and propellant, Lockheed has created a deadly new hybrid in the Direct Attack Guided Rocket (DAGR). The DAGR pairs the 70mm Hydra rocket with existing Hellfire II systems and launchers to create a small and cheap to produce precision munition capable of taking out lightly-armored targets near civilians or friendly forces. The Hellfire II system delivers a 20 pound payload of high explosive which often injures those near the target. The 70mm—that's diameter, the rocket is 75 inches long, 2.75 inches wide, and weighs 35 pounds—Hydra rocket on the other hand only carries about 2.3 pounds of high explosives in its M151 warhead and therefore generates much less splash damage. The problem is getting the Hydra to actually go where you want it—as an unguided munition, it only goes generally in the direction you're aiming. "Pilots in theater have expressed a desire for a guided rocket that hits the target and minimizes collateral damage," said Jerry Brode, DAGR program manager at Lockheed Martin Missiles and Fire Control. What's more, Hydra rockets are quickly becoming a legacy technology and is being replaced by the larger Hellfire II's. The DAGR, as you can imagine, solves all of these issues. Lockheed equipped the Hydra 70 rocket with the Hellfire's Joint Air-to-Ground Missile system, which uses IR imaging, semi-active laser, and millimetre-wave radar for guidance. This allows the previously unguided rocket both lock-on-after-launch (LOAL) and lock-on-before-launch (LOBL) capabilities. 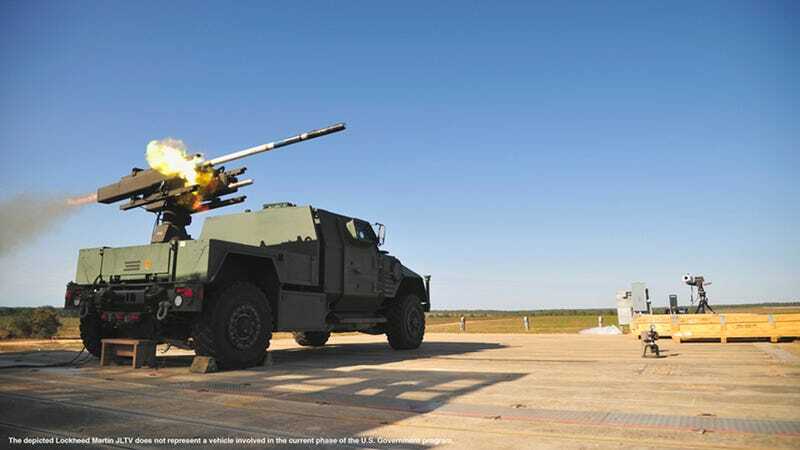 The DAGR can also plug-and-play with the M299 Hellfire launcher and all the vehicles that it attaches to—potentially quadrupling the total number of munitions each can carry. Previous guidance systems like the LCITS, still relied on the older Hydra launchers. The DAGR system has already completed live fire testing on a host of rotary aircraft like the Apache, Cobra, and Tiger helicopters, and the Little Bird UAV.